I love citrus curds. Lemon, lime – even orange. They’re velvety, slightly sweet, quite tart and the perfect topping for a wire variety of baked goods. I am not going to claim that this is the best use for a curd because I still think that my spoon is the finest vehicle, but it is a darn nice way to eat it. A crisp buttery cookie makes a great shell for the lime curd, though, like all cookies with moist fillings, the crispness does not last for more than a day. It gives way to a moist, buttery, crumbly cookie that melds into the curd in a very appealing way. I used Alice Medrich’s recipe for lemon curd and simply substituted lime juice for lemon juice. I didn’t believe that a curd without butter would work, either, but it’s great! Tanvi adapted the recipe to a lighter lemon curd a while back, reducing the sugar from the original. I advise against reducing the sugar in this recipe if you are going to use limes, unless your limes are far less tart than mine. If you have a strong aversion to tartness, you can add one more tablespoon of sugar. Next time, I think that I will stir some lime zest into my curd, which I forgot to do this time, to emphasize the fact that this is lime and not lemon. The vanilla flavor came through wonderfully after refrigeration. The cookies are easy and versatile. I made them in the “thumbprint” style of cookie here, but you can roll them out or refrigerate the dough and slice them later. The dough produces nice, crisp cookies when unadorned. You can also use jam when making little mini-tarts here, but the lime curd makes them zesty, bright and addictive. esides, you can eat more than one tart and feel good about it. How often can you say that? In a small sauce pan, over medium heat, dissolve sugar into lime juice. Add zest. Cream together butter, sugar and salt. Beat in vanilla, milk and cornstarch. Stir in flour until just combined. Roll into 1 inch balls and roll in coarse sugar. Place on baking sheet and make a shallow indentation with your thumb. Fill indentation with a bit of lime curd or jam. Bake tarts for 12-13 minutes, until cookies just start to brown. These look delicious, Nic, and with butter-less curd…wow! I was wondering, could I hire you to make my wedding cake??? Angelika – Oh, I think that this would be a great holiday cookie. They’re just so cute! Cin – I know – butterless curd is crazy (but tasty!). Aww..those cookies look so cute and delicious! 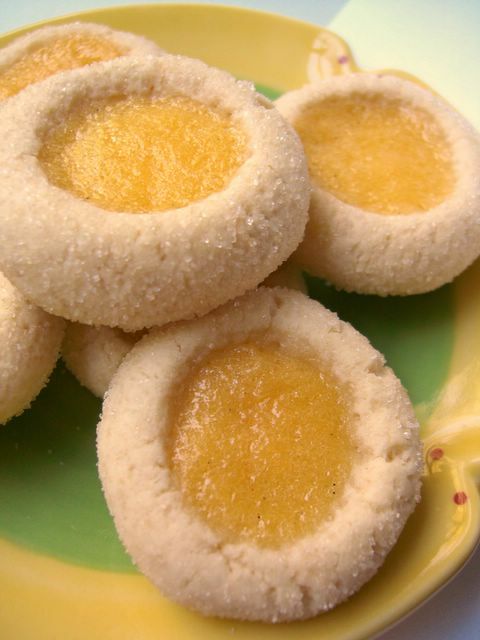 My grandmother used to make thumbprint cookies with strawberry jam. They looked just like yours and made me think of the old days! That’s a beautiful picture, Nic. I was going to attempt these tonight, so my better half can bring some to a baby shower tomorrow. But, I had a question about the cornstarch. What does it bring to the final ‘cookie’? And, is that much really needed? Eric – It gives the cookie a crisper, more tender texture because it does not, unlike flour, contain gluten. I would not reduce it, but if you absolutely cannot get it, you could try substituting flour. Hey Nic- what a wonderful usage for the lighter curd! I, like you, think my spoon is the best vehicle for any type of curd, but its a lovely replacement for jam in thumbprint cookies. Anne – It does keep well. I’m sure in a sterlised jar it would keep even longer, but I will keep it in the fridge for about a week or so, covered with plastic wrap. It might keep longer, but once it’s open, it goes fast! used a mixer, but only got 6 additional cookies. chewy, though I tried not to manhandle the dough. Hi Ann. My best suggestion is to check your oven temperature, because over-baking could cause the cookies to toughen and high temperatures are much more likely to make jam run out. Jam is also more likely to run than something denser, like curd. I used the back of a measuring spoon (a 1/4 tsp, I believe, as you mentioned) to make the holes for the curd in the dough and a deeper hold could help with the running problem. The cookies are not large, so I think that you might have made them bigger than mine. I don’t know what could have caused them to flatten; since there is no chemical leavening, I really wouldn’t have expected that! I’m sorry to hear that this didn’t quite work out for you, though. If you decide to try it again, let me know how it works out for you. If something goes wrong, I’ll go back and troubleshoot my recipe. Hi, I’m looking to make a lemon, white chocolate chunk cookie that I don’t actually have the recipe for but really like. So, I’m wondering if you can substitute the lemon curd for zest and put it IN the cookies. Am I being a little insane? Loved the lemon curd – it is the perfect filling for these cookies ! I made the cookies but the dough was REALLY dry. I ended up adding an egg. Can you double check your recipe? Thanks! torley manor » thumbs up to thumbprint cookies!